30b30#4.5: Kuah Wong Sup Jamur | As I blog. There are only two challenging steps to making and enjoying Kuah Wong Sup Jamur (Clear Mushroom and Vegetable Soup). First, you need kaffir lime leaves. This is possibly more exotic than your average major grocery store will stock. I found mine at Ava's Downtown Market, but I imagine Whole Foods carries them, and probably most Asian grocery stores. 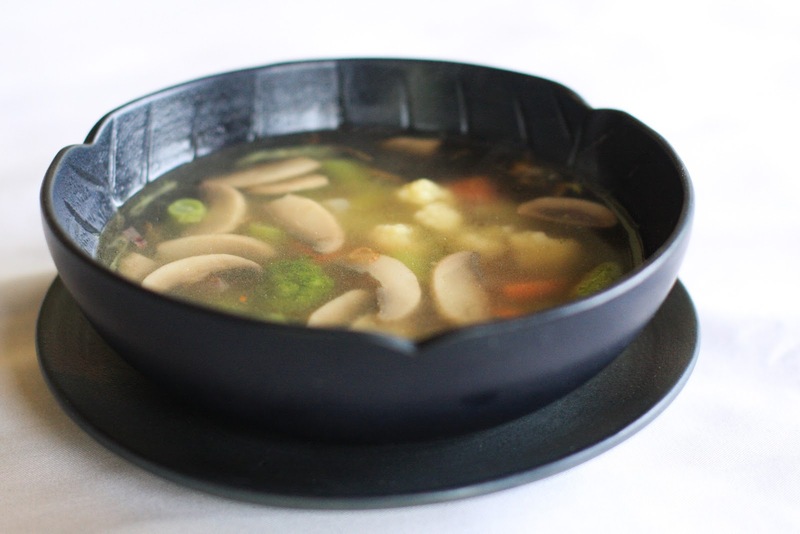 Second, this soup tastes a lot better when made and eaten in Bali, so book a trip to fully enjoy. This was one of the recipes I made in a cooking class there, and I've tried making it twice since coming home, but it's just not the same magic I remember. A lot of things taste better when you're on vacation, but I suspect it's because I haven't been making homemade broth. I bet Puspa's broth had some godly edge from Annapurna too! It's still yummy, and I love how kaffir lime leaves add such an incredible aroma and taste to an otherwise simple (boring?) soup. I won't rush to make this again, but only because I think I can do better (and need to find and try 25 other recipes). I'd happily take a bowl if you want to though! Prepare the vegetables: slice mushrooms, garlic, spring onion, and shallots; cube the carrot into centimeter pieces; slice the chili and remove the seeds; cut the lemon into slices. Saute garlic, shallots, and spring onion until light brown. Add mushrooms and chili and continue to saute. Pour in the chicken stock and squeeze the lemons into the stock. Bruise the kaffir lime leaves and add those too. Bring the stock to a boil, and add carrots, green beans, and salt and pepper to taste. Serve in a bowl with deep fried shallots as garnish.